InstacartInstacart used to have exclusive rights to Whole Foods delivery. That changed when Amazon acquired the grocer. 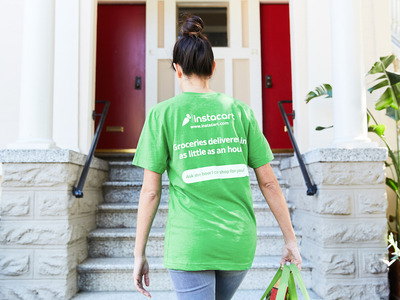 Instacart is a delivery company that pairs customers with personal shoppers who deliver groceries to their homes. 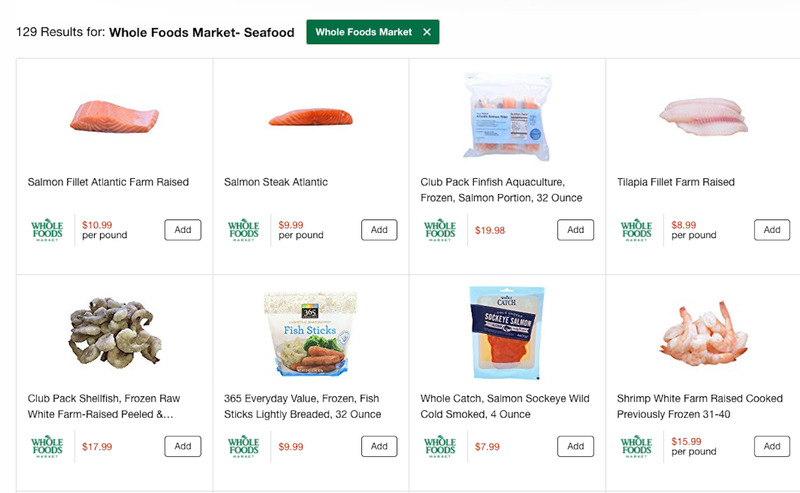 In 2016, it signed a five-year contract with Whole Foods to become its exclusive delivery partner, but in 2017, Whole Foods was acquired by Amazon. 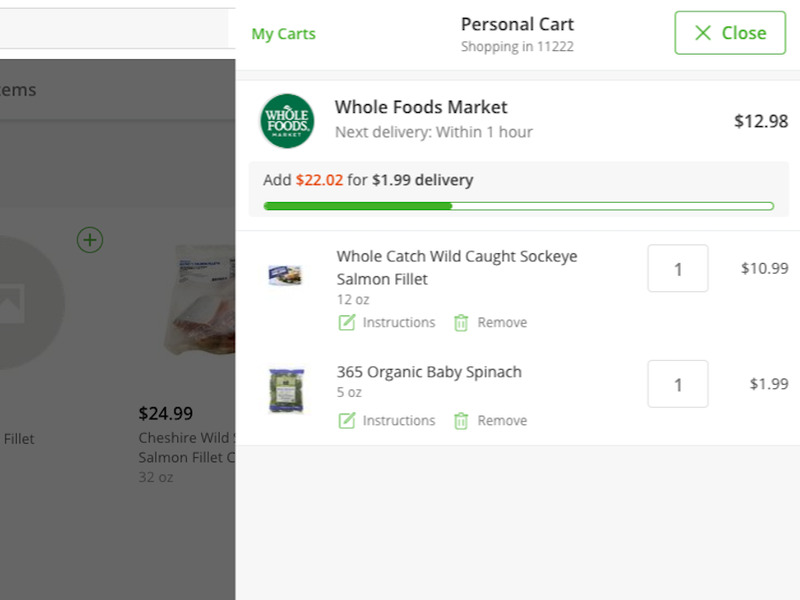 Instacart now goes head-to-head with Amazon’s own Whole Foods delivery service through Amazon Prime Now. 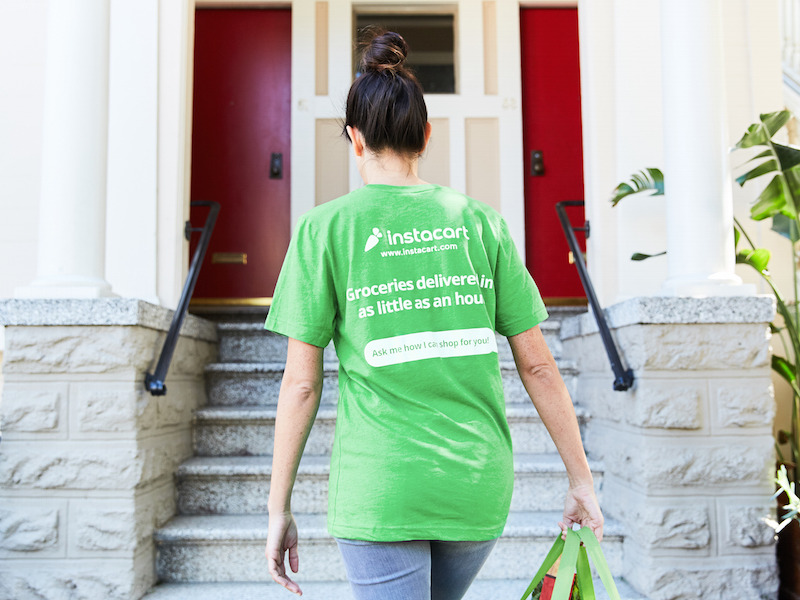 On Wednesday, Instacart announced that it is rolling out a new click-and-collect service at select stores nationwide. This service will not be offered at Whole Foods. 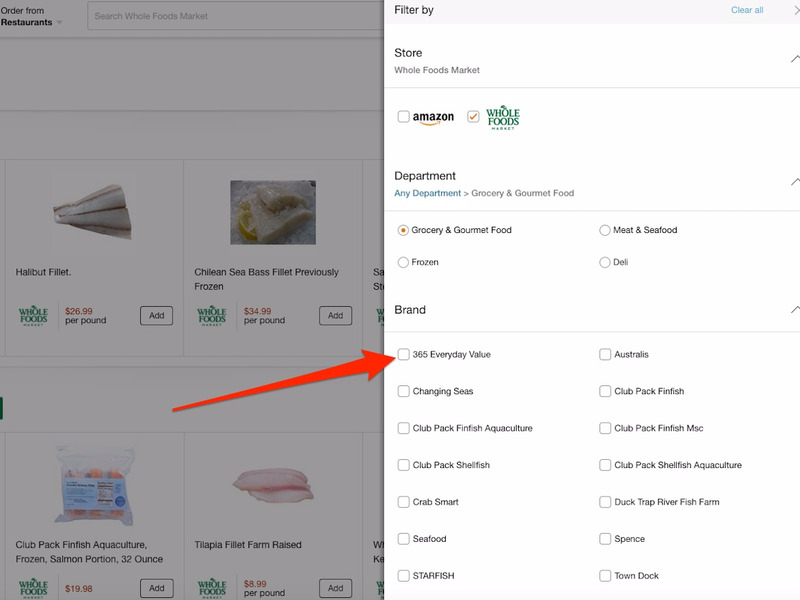 Back in October, we decided to put Amazon Prime Now and Instacart to the test. Here’s who came out on top. 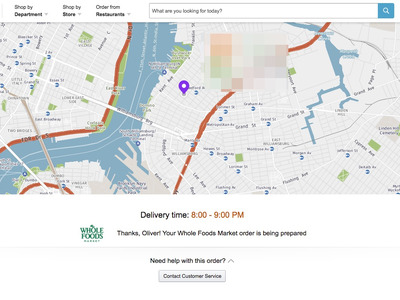 Up until last year, there was only one way to have Whole Foods produce delivered to your door: via Instacart, a delivery company that pairs customers with personal shoppers who pick groceries in the store and deliver them directly to people’s homes. This changed in June 2017, when Amazon announced that it would be buying Whole Foods for $US13.7 billion. 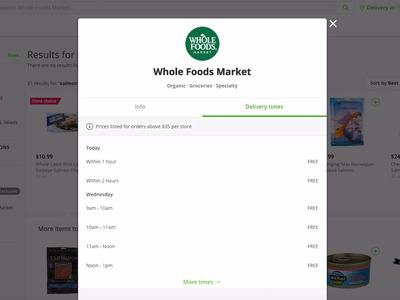 The announcement sent shockwaves through the market and put Instacart, which had exclusive rights to Whole Foods’ delivery, in a sticky situation. 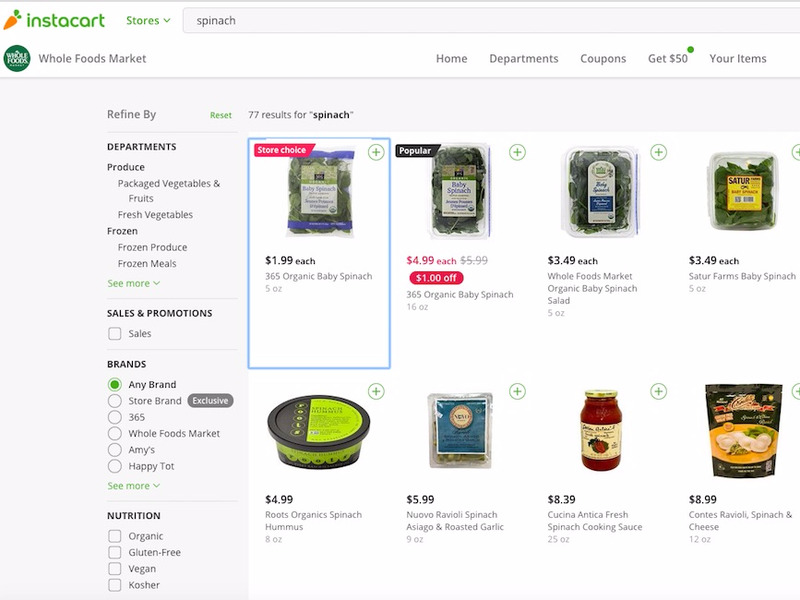 Shortly after, Instacart signed deals with several major US retailers including Sam’s Club, Costco, CVS, Albertsons, and Kroger, but industry experts were left wondering what would happen to the five-year contract that it had signed with Whole Foods in early 2016 and was only a year and a half in to. 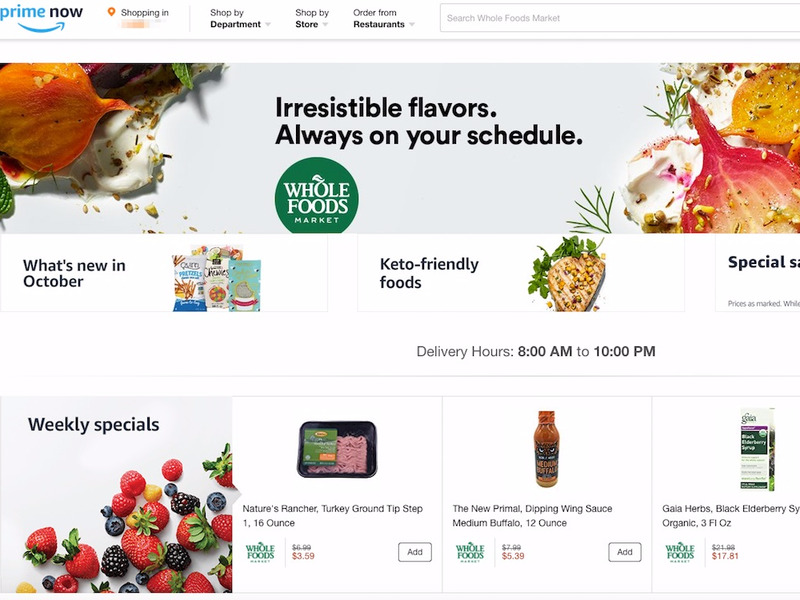 Instacart continues to deliver for Whole Foods along with Amazon’s own delivery services, but experts say it likely won’t be long before it’s muscled out. The company is now looking to grow elsewhere. On Wednesday, it announced that is rolling out a new click-and-collect service to a selection of stores nationwide. This will not be offered at Whole Foods, however. I started by ordering from Instacart’s website. As this was the first time I used the service, I was asked to enter my zip code and set up an account. Business Insider/Mary HanburyYou can also order via the app. It’s easy to register, and you can log in directly using a Google account without having to register any details, which is definitely a bonus. 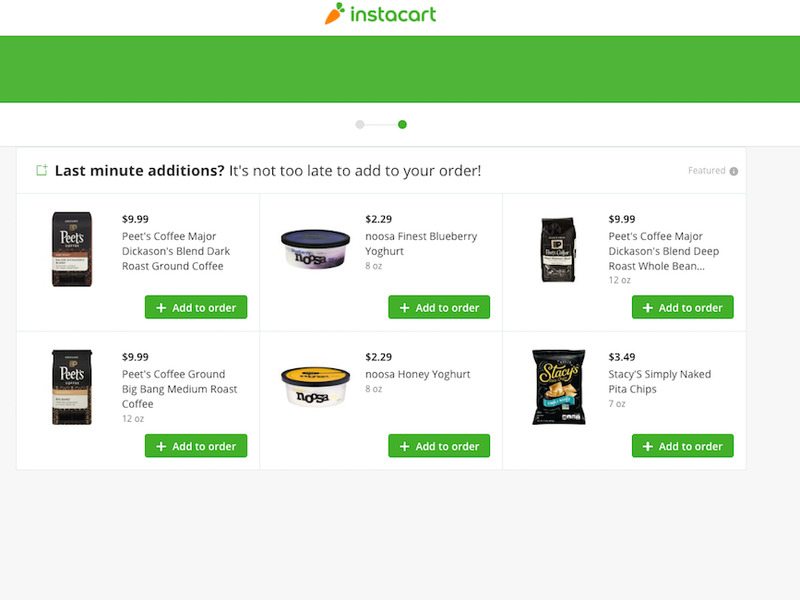 Once I logged in, Instacart went straight to selling me a membership. 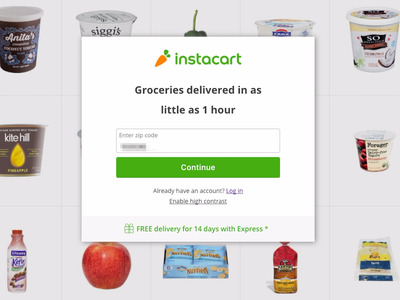 Instacart Express works in a similar way to an Amazon Prime membership. 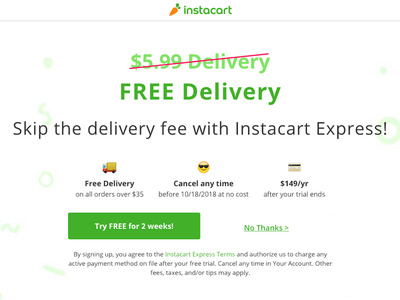 You pay $US149 a year and are able to get free shipping when you spend over $US35. However, given that the selection on Instacart is limited to groceries, pet supplies, and drug stores, you are getting far less for your money than with an Amazon Prime membership. Prime costs $US119 a year and includes free shipping of almost anything you can think of on Amazon.com as well as access to a ton of perks such as Prime Video and Prime Music. 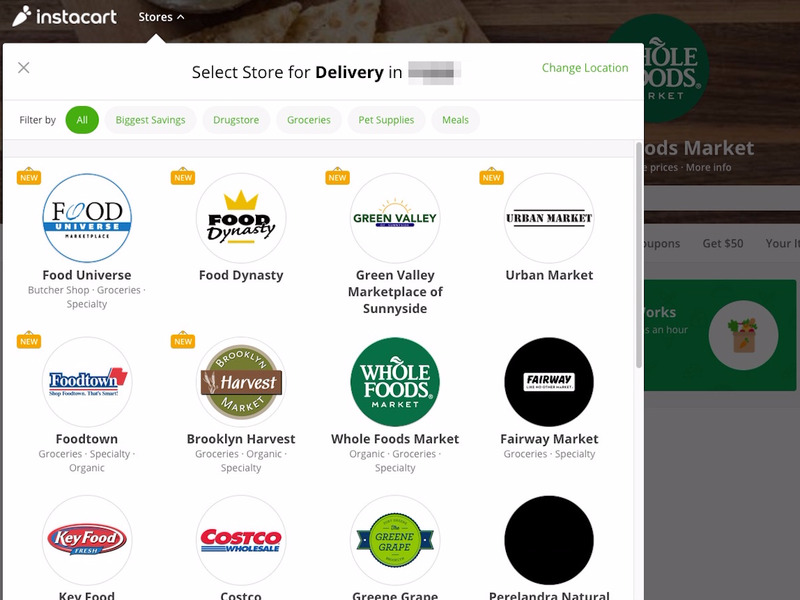 When it comes to shopping for groceries alone, Instacart is the leading player. On here, you can shop from 300 different chains. Business Insider/Mary HanburyThe 300 chains include pet and drug stores. The first step is to select the store you want to shop from. I chose Whole Foods. The site is easy to use. You can shop by department or search for a specific product. You can filter by brand to find items more easily. This is especially useful if you want to shop Whole Foods 365, the grocer’s budget label. When I clicked on each product, there was very limited information available aside from a photo that was hard to see. This was a major downside. 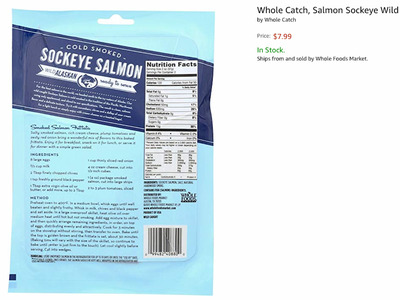 Business Insider/Mary HanburyIt wasn’t immediately clear whether these were frozen or fresh salmon filets. In small writing on the packaging it says “ready to eat,” but when the package arrived, I realised it was frozen and would need to be defrosted before cooking. You don’t need to click through to lots of other pages to find out when these items can be delivered. 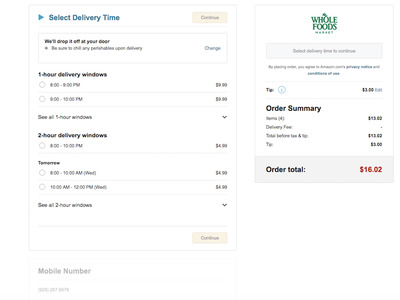 A tab on the right-hand side shows you exactly how soon you can receive the order. 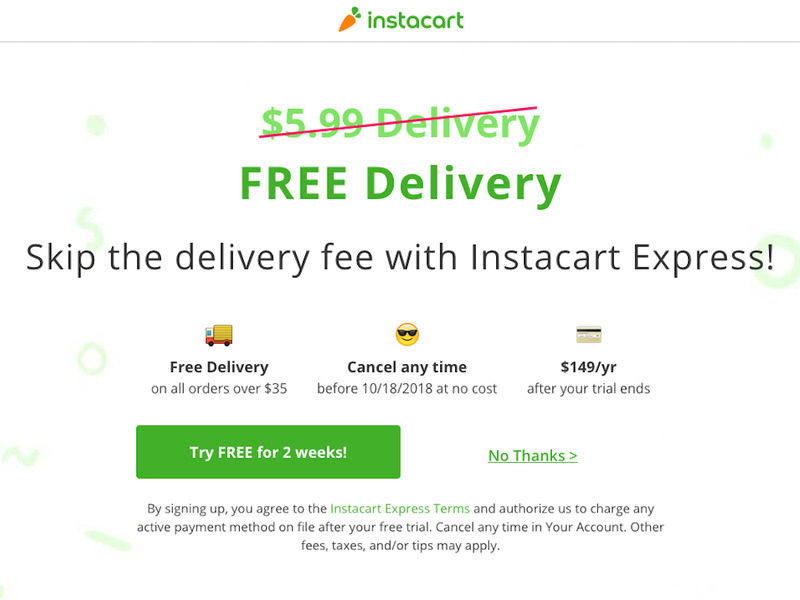 When you click on the cart, it clearly states how much more you’d need to buy to be eligible for cheaper or free delivery depending on whether you are an Express member or not. Business Insider/Mary HanburyYou can add instructions for the shopper here. For orders under $US35, there is a hefty delivery charge costing anywhere between $US11.99 and $US15.99. I opted for delivery within the hour to test its speedy service, and this cost $US13.99. 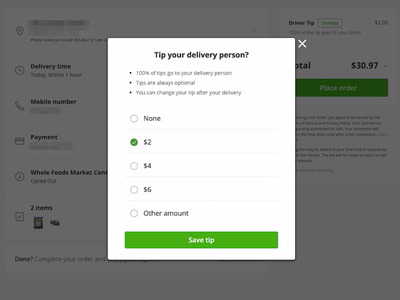 A 5% tip is suggested at checkout, with a minimum suggestion of $US2 per individual store delivery. 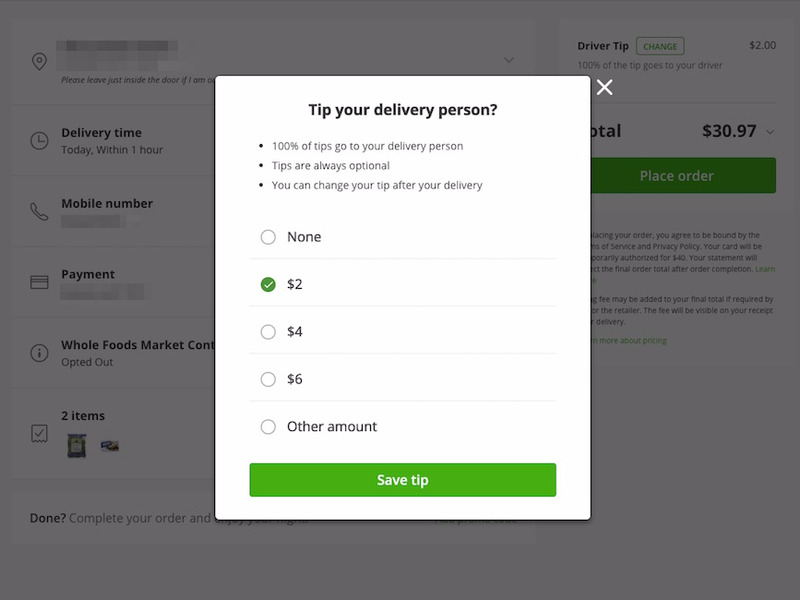 The tips are optional, and according to Instacart, you can adjust them up to three days after the order is delivered. The tips go directly to the shopper. 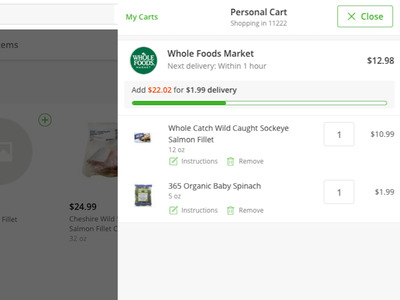 Customers also pay a 5% service fee on each order, which goes directly to Instacart. This becomes pretty pricey on larger orders. It’s a slick process, and within five minutes I had placed the order. At the end, it gave me one last push to add more items to my basket. 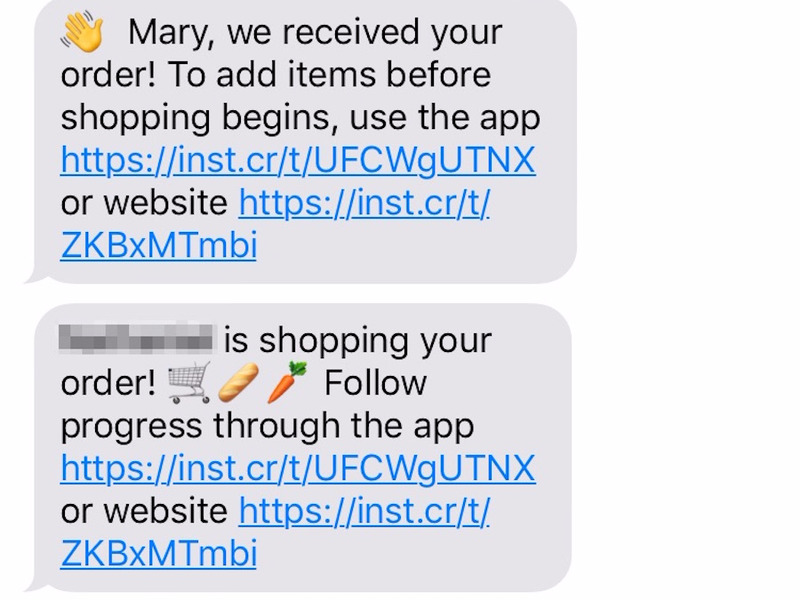 Once I completed the order on the website, I received a text message with a link to the app that allowed me to track the order. 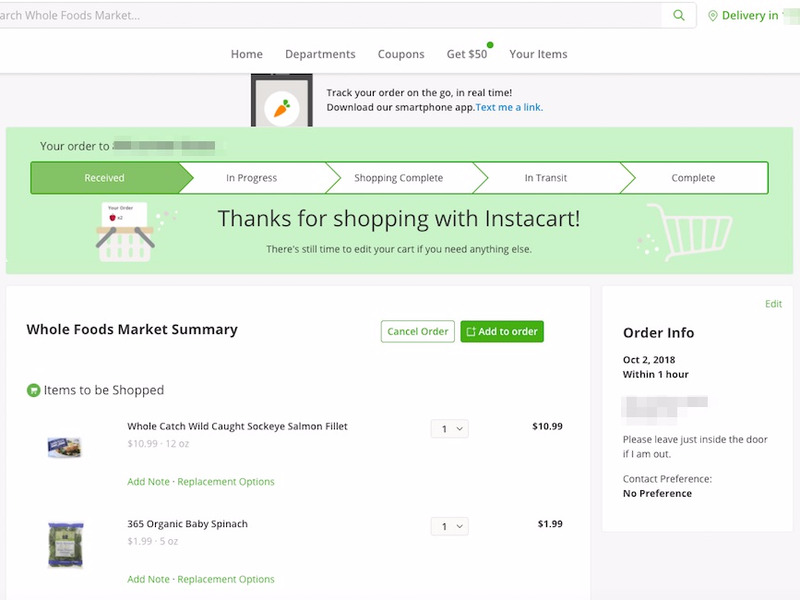 InstacartThis was followed up by a confirmation that the order had been picked up by the shopper. It’s easy to message the shopper on the app and select alternatives if anything is out of stock. Within 30 minutes the package had arrived on my doorstep. I hadn’t even had enough time to make it back home from work. 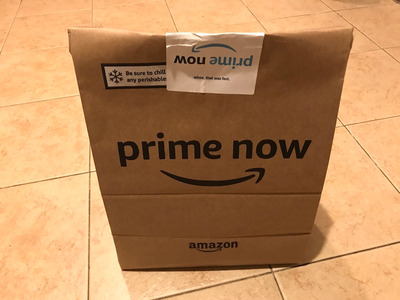 Next, I tested out Amazon’s Prime Now service. Prime Now offers free, two-hour delivery of Whole Foods groceries as well as a mix of items from Amazon.com to members of its paid Prime program in about 30 metro areas across the United States – if they spend over $US35. The main page is very similar to Amazon proper, so it instantly felt familiar. However, it’s not as user-friendly as Instacart. 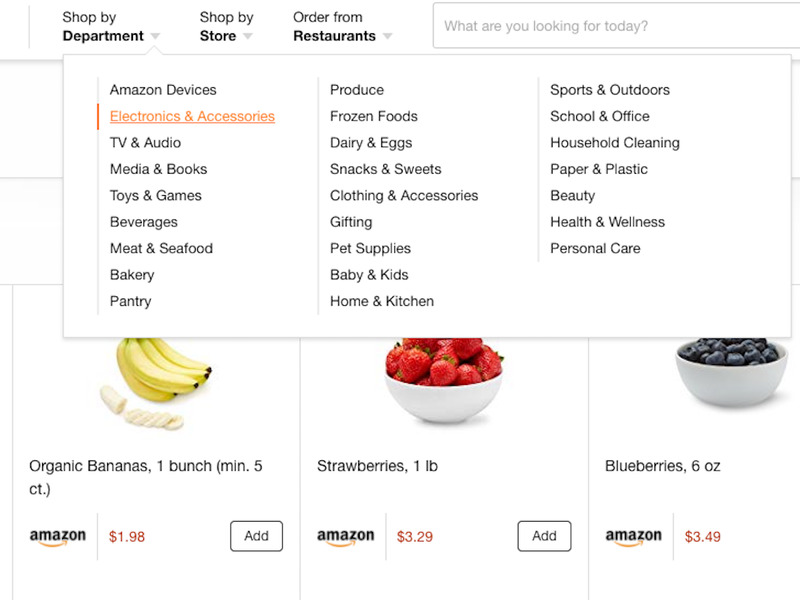 At the top of the page, you can search different departments, but the groceries are jumbled in with other Amazon products, which was confusing. At the bottom of the main page you will find product categories that are easier to search. I clicked through to seafood and found a selection of fresh and frozen produce. 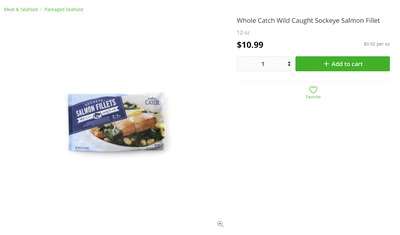 The assortment seemed to be identical to what was on Instacart, and the prices were the same. It’s not immediately obvious, but on the right-hand side, there is a button that gives you the option to filter by brand. That way you can find the budget Whole Foods 365 items. 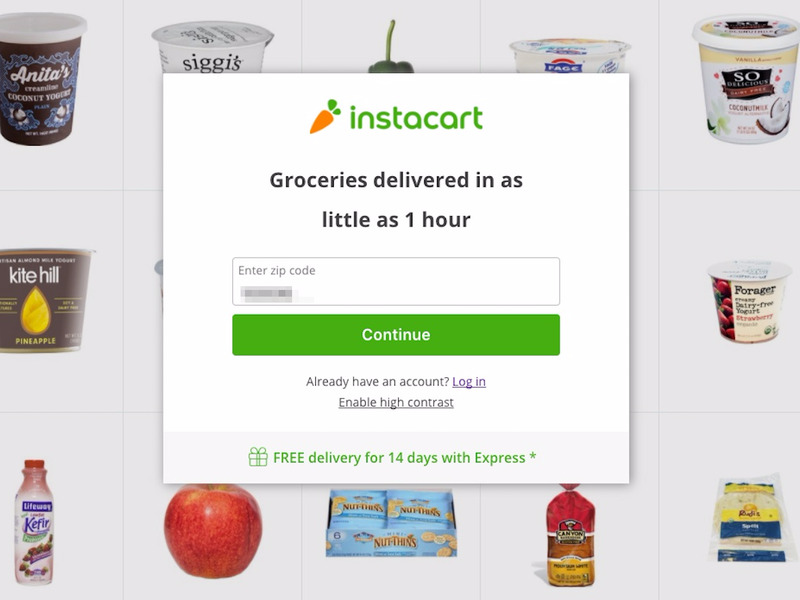 Instacart definitely made this process easier. 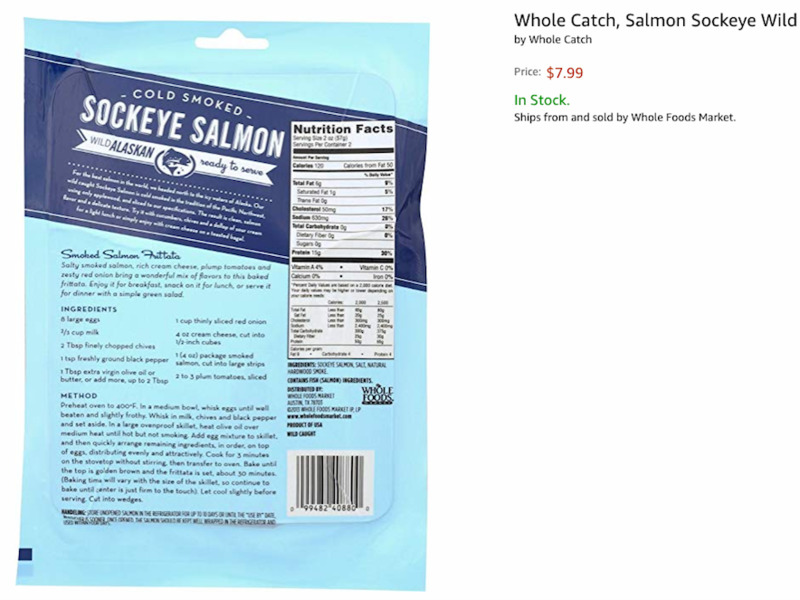 One big advantage is that on most of the items I selected, I was able to see the nutritional information of the product. This wasn’t the case on Instacart. During the ordering process, Amazon alerts you that if a product is out of stock, it will contact you to let you know. If it doesn’t hear back from you, it will leave the item out of the order. 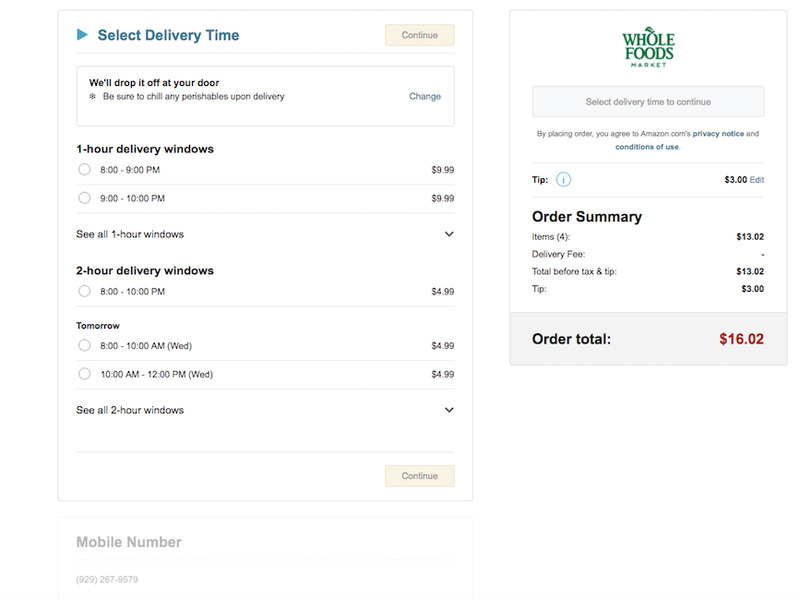 The options for delivery weren’t as speedy as Instacart’s. At first glance, I thought there was a within-the-hour delivery option, but this wasn’t the case. I ordered around 6:30 p.m., and the soonest it could arrive was between 8 p.m. and 9 p.m.; this cost $US9.99. Business Insider/Mary HanburyYou have the option to add special instructions onto the order at this point too. Amazon automatically added a tip, which you can amend if you like. 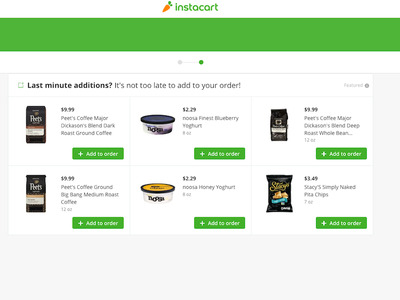 There was no extra service fee, however, which is an advantage over Instacart if you are doing a large order. 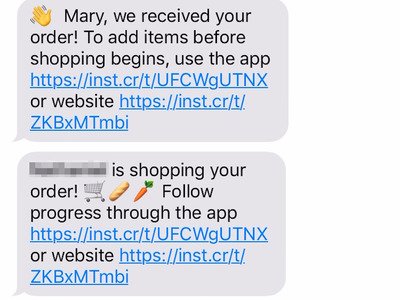 Once I placed the order, I received several text messages and requests to download the app so I could track my order. Both Amazon and Instacart had a similar approach to keeping you updated about the order. My order went through at 6:24 p.m. and arrived by 8:33 p.m. 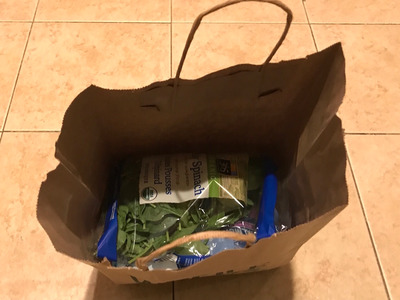 If your groceries are going to be out on your doorstep for a while, you might appreciate that the Prime Now delivery bag is actually closed. It was a bit off-putting to find an open Whole Foods bag with the Instacart delivery in it, as it felt like anyone could help themselves pretty easily. Verdict: Instacart was the winner overall. The website was easy to use, and the options for delivery were considerably quicker. The main benefit is that you don’t need to have a membership to use the service. 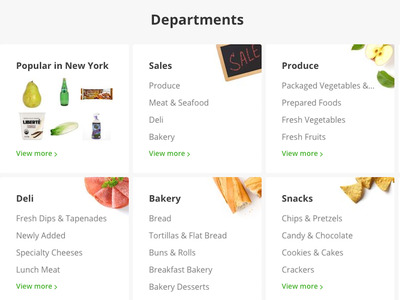 There is one big downside to Instacart, however. If you’re ordering on a frequent basis, the service and delivery fees do add up if you aren’t an Express member, and it’s hard to justify a $US149 annual fee when Amazon Prime is not only cheaper but grants you access to more perks.